The Feet of Those is a new series of paintings by Alastair Gordon commissioned by London City Mission to celebrate their 180th anniversary. For the last six months Gordon has worked alongside London City Mission as they work with Londoners with greatest need including the homeless, street workers and drug addicts. The Feet of Those celebrates the ongoing work of London City Mission with an eye to the work of those who have gone before them. The Feet of Those can be read as a form of portrait or incomplete inventory of those who work for London City Mission during their anniversary year, taking their shoes as a starting point. Gordon has painted 70 new works representing a cross section of the charity team. Gordon’s painting strongly references a form of illusionistic painting that proliferated in Northern Europe in the 1600s. A specific form of trompe l’oeil called quodlibet (as it falls). His faithful representations and compositions might be understood within the context of the collection, referencing the theatrical spectacle of the cabinet of curiosities or perhaps, more specifically, contemporary museum displays where an assortment of artifacts are presented with both apparent objectivity and through the subjective lens of the curator. 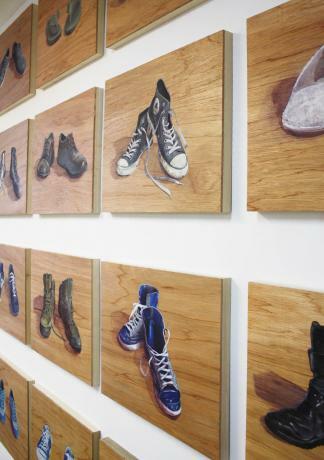 The grain of the wooden ground becomes part of the painting, causing the image to oscillate between artifact and artifice. Alastair Gordon is artist in residence and gallery manager for HUSK, East London. He was recently selected for the Threadneedle painting prize, Shoosmiths Art prize and The Open West 2014. His work is represented by Bearspace gallery in Deptford and features in several international collections.